Alexander Loew, from Weissenburg in Bayern, Germany is the Founder and Resident Artist of the Fin Arts. Alex is the creator of the Shark Sculptures, by combing those and his Ocean Art he is advocating for the Sharks and the marine environment. During his time as a Scuba Instructor& Cruising Director in Thailand he saw how necessary it is to create awareness for marine conservation. 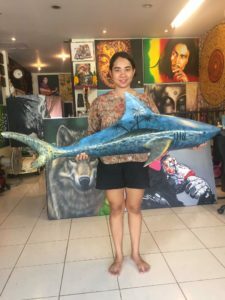 Weissenburg is far from the Ocean but being a former bio farmer and as an artist working with all the elements of our world she also has an affection for all animals and and interest to help to preserve the balance in the environment. Khun Landyn Bamrungehat, holds a Bachelor Degree in Design is from Yala Province in South of Thailand. 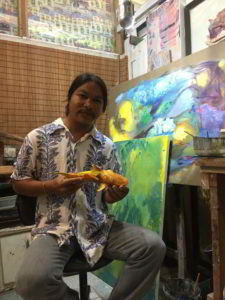 He has been living in Phuket for 11 years with his family and since then he is doing his abstract art in acrylic color. He was always inspire by the nature especially the ocean, waves and coral. He is also working with drift wood. 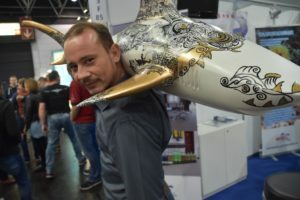 He says the Shark has to be protected for future generations because it is a vital part of the oceans. 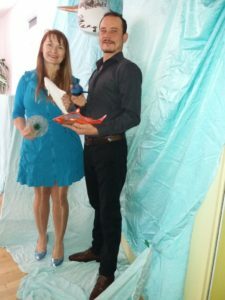 Khun Siwawong Pratummnee from Songkla where she attended art school is one of our local artists. Her unique art work is inspired by traditional Thai Art combined with Nature elements. She also specialized in portrait painting.